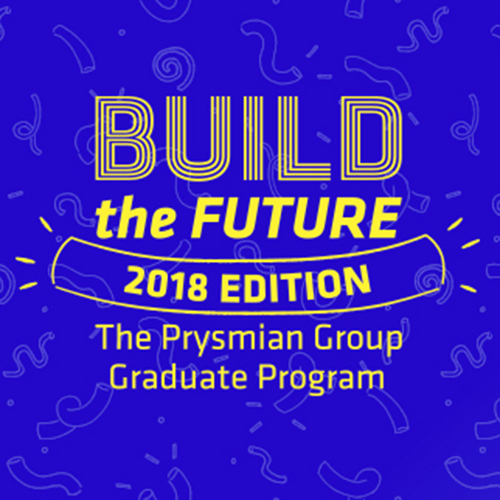 Every year, we select a small number of talented graduates from all over the world and give them the chance to develop the skills and expertise they need to succeed at The Prysmian Group. Now it’s time for the 7th edition of our exciting international graduate program “Build the future” to commence in early 2018. The new search process is aimed at selecting 40/50 new graduates in Economics, Business, Engineering, Physics, Chemistry and Mathematics in Italy and worldwide. This year’s edition will bring the number of talented young people of various nationalities who have joined the company through the “Build the future” program to approximately 250. Candidates must have a strong entrepreneurial spirit, be interested and willing to learn, be fond of technology and innovation, be open to changes and able to work in a challenging and competitive industry, be capable of working in teams and possess leadership skills, have a strong desire and motivation for an international experience within Prysmian and have excellent English skills.